Hey gang, Valkor here. 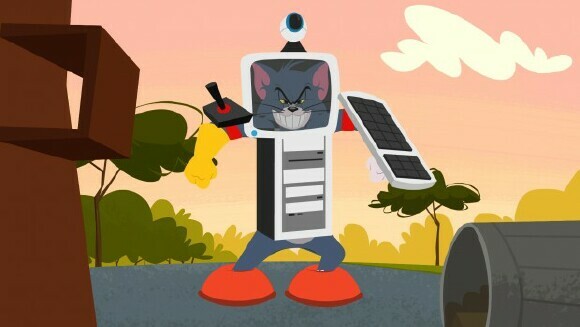 And it’s been quite some time since the cat and mouse duo of “Tom and Jerry” have graced the pages of TOV; what the heck, I didn’t think any more cartoons were being produced. That is until the gang over at WB Entertainment dropped this sweet new DVD on our doorstep. 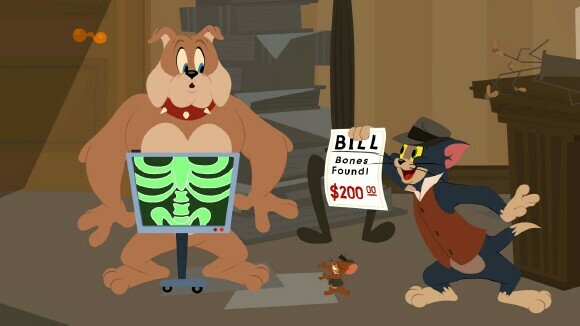 “The Tom and Jerry Show: Funny Side Up” offers up something old, a whole lot of new and loads of laughs. Check it out. 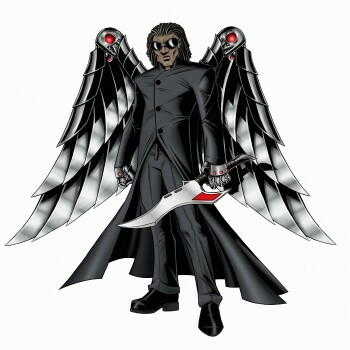 My Bot-y Guard (Valkor Favorite) – BOT has been given a home security upgrade, so anyone breaking into the lab or making the slightest noise will set him off. 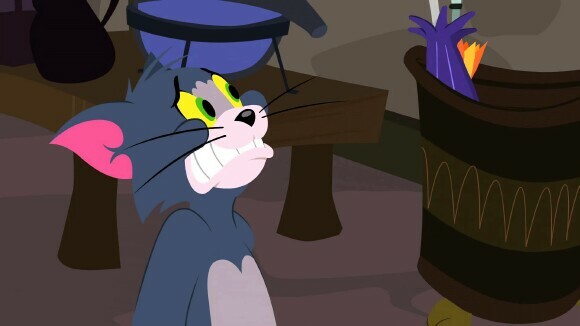 So you know it’s gonna go down when Tom makes the scene looking for a rodent snack. Pets Not Welcome – The gang of Spike, Tom, Jerry and Nibbles go on vacation with the humans of the show. But Pets aren’t allowed in the hotel, so the family attempts to sneak them in. Of course cat + mice + dog are a recipe for disaster. Little Quacker and Mister Fuzzy Hide - Tom has cooked up a meal not fit for the witch sisters and leaving it out it ends up in the hands of Little Quacker, which turns him into a raging beast… or does it? Cat Napped – in homage to “Rear Window”, Tom is broken, bruised and wheelchair ridden. His only form of entertainment are these binoculars where he spots the lovely Misty. Tom’s new love interest is suddenly cat-napped and it’s up to him, Jerry and new dog pal Scarf, who also seems to have some romantic interest in Misty, to find her. No additional extras are available on the set, though I would have loved a behind the scenes type featurette that went into the series creation, the choice to bring back the original vocals and also the design of the characters. All of this combined really brings back that classic look and feel, though it’s not completely perfect. And I’ll tell you why in the TOV Breakdown. 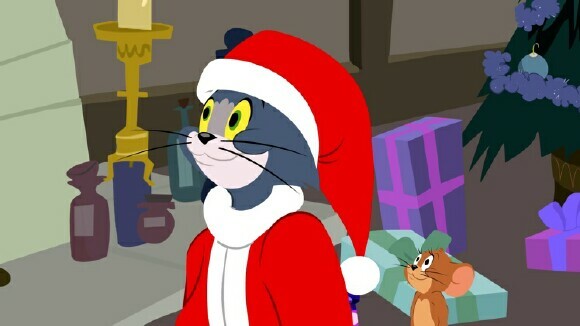 I know we’ll never get to see the over-the-top violence of yesteryears, but that’s truly what’s missing to make Tom and Jerry whole; you can bring back the design and the voice, but if the level of slapstick isn’t there such as Tom getting his tail chopped off, or Jerry narrowly missing an axe to the back to reveal a girdle underneath his skin then it’s simply isn’t “all the way the same”. I’ve accepted that aspect of the characters will never see a return and me mentioning it here is just my way of letting go and accepting the new. At least I have the classic stuff to fall back on and I have room in my heart for this new set as well. 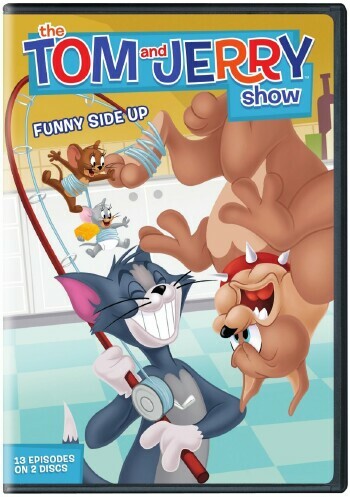 The Tom and Jerry Show: Funny Side Up is available now and it’s a entertaining good time that can be had by all; it’s filled with a lot of laughs, a mix of old and new characters as well as other aspects of the original shorts that can truly be appreciated by all ages. And out of TOV 5 stars, I give Funny Side Up a 4.